As part of Anglian’s support for Big Energy Saving week here is a guest post from British Eco Ltd, who share their energy saving tips with us. With energy bills rising year-on-year, many home owners are looking for ways of lowering their costs. Improving the energy efficiency of your home by adjusting how you use energy and switching to renewable sources could be the most effective way to do this. 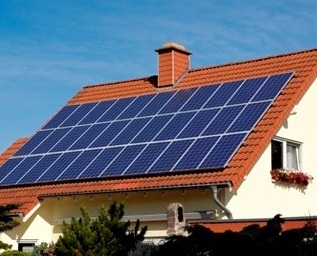 Renewable energy provides home owners with a full-house solution for increasing their energy efficiency as well as an opportunity to move away from increasingly expensive and inefficient fossil fuels. Instead, you could be making use of the earth’s clean, free and vast resources for your energy. From the sun to the wind and rain, renewable energy technologies help you make the most of the energy that is around you, whether it be for electricity, heating or water. Many of you will have seen Solar PV on a friend or neighbours roof, but did you know that using Solar PV can decrease your electricity bills by hundreds of pounds every year? And it’s not just electricity that you could be saving – renewable heating technologies such as biomass, heat pumps and solar thermal systems could reduce your heating and hot water bills by up to 75. These systems all make use of the constantly replenished energy sources around you and are not subject to volatile price hikes often seen with gas. Did you know that the UK Government has set a target of reducing greenhouse gas emissions by 34 by 2020? This increases to 80 by 2050. The good news is that there is plenty that you can do to contribute and acting now will not only help achieve these targets, but will save you money at the same time. Making small changes to the way that you use energy in your property can make a big difference. You can feel good about making these changes because you’ll be lowering your carbon emissions as well as helping the environment. When your electrical appliances are on standby, they are still using energy. Switch them off for some quick and easy savings. Every degree that you reduce your central heating by could save you around £60 a year! Make use of all the free, clean energy around you and switch to renewable energy technology. Solar PV, Solar Thermal, heat Pumps, Biomass Boilers, wind turbines and rainwater harvesting systems can all contribute towards lower energy bills and higher energy efficiency. BritishEco Ltd are fully accredited suppliers, designers and installers of these systems. Switch to low-energy lightbulbs and see how much you could save. Don’t need a full kettle of water? Then don’t fill it up! Making small changes every day can help you save energy. Visit www.britisheco.com for more information on renewable energy and energy saving tips.